From 2000 to 2014, countries and donors spent a combined $207 billion on children’s health – and saved the lives of 34 million children. To come up with this number, we partnered with the UN Secretary-General’s Special Envoy for Financing the Health Millennium Development Goals and for Malaria to create a tool, the Lives Saved Scorecard, that will allow governments, policymakers, and donors to track investments in child health and to link these investments to child deaths averted across countries in a comparable way. We looked at spending through two channels: first, 135 low- and middle-income country governments, which spent $133 billion on child health and saved 20 million lives. Second, we looked at private and public donors – primarily high-income countries and donor agencies – which spent about $74 billion and saved 14 million lives. We examined 36 low-income countries and 99 middle-income countries, from Bangladesh to Togo, Nicaragua to Vietnam. The cost to save a child’s life varies, from more than $10,000 in upper-middle-income countries like Mexico, to just over $4,000 in low-income countries like Mozambique. Donors tend to concentrate funding in the poorest countries, so while country governments spent nearly twice as much on child health in their countries as donors, they saved only one-third more lives. 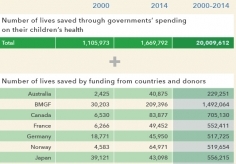 The 14 million lives saved by donors can be broken down in two different ways: by looking at spending from high-income countries and donors as a source, or by looking at the spending of agencies, like Gavi or UNICEF, through which donors channel their funding. While these two approaches represent the same total child deaths averted, each provides important information on how donor investments translate into improved health. For example, the US government, as a donor, saved 3.3 million lives through child health investments between 2000 and 2014. Some of those investments were channeled through USAID, the US bilateral aid agency, which saved almost 1.7 million lives during that period. From the donor lens of the scorecard, funding from eight countries and the Bill & Melinda Gates Foundation (BMGF) combined to avert nearly 10 million child deaths. Three donors were each responsible for investments that saved more than a million lives between 2000 and 2014: the US, the UK, and BMGF. The other lens through which we can understand the lives saved by donors is to look at the spending of donor agencies on child health interventions. 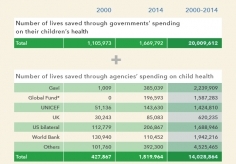 Five agencies saved more than a million lives each over the period of 2000 to 2014, including Gavi, the Global Fund, UNICEF, USAID, and the World Bank. The death rate in children younger than 5 years in low-income countries has dropped by more than one-fourth since 2000. We hope that this scorecard can keep attention focused on further progress in all countries and help to identify where the greatest opportunities exist to save lives and improve health.